Quartet Bulletin Bar, Natural Cork, 48" x 1", Aluminum Frame (2006) | Replicafer Co.
Super Savings Item! Save 37% on the Quartet Bulletin Bar, Natural Cork, 48'' x 1'', Aluminum Frame (2006) by Quartet at Replicafer Co.. MPN: 2006. Hurry! Limited time offer. Offer valid only while supplies last. The Quartet Cork Bulletin Bar is perfect for posting documents at your desk. The durable, self-healing cork helps extend the life of your board. The Quartet Cork Bulletin Bar is perfect for posting documents at your desk. The durable, self-healing cork helps extend the life of your board. Holes will re-close when push pins are removed, which helps prevent crumbling over time. 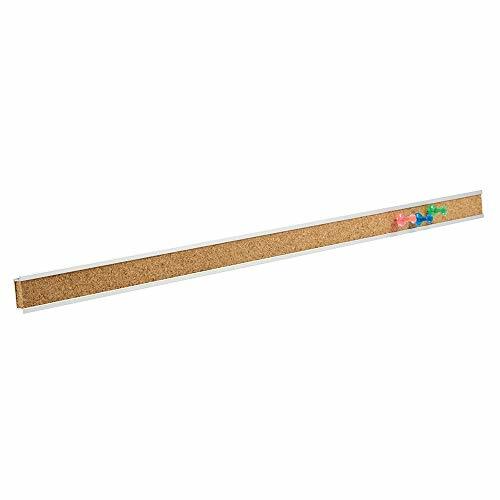 With its natural cork and sturdy aluminum frame, this board will add a classic look to your office or home. Both strong and stylish, it will be a great addition to your space. Quickly post items anywhere on the 1/4" thick cork surface. Convenient for hanging reminders or displaying reference documents. Flexible mounting lets you set up your cork bulletin bar either horizontally or vertically. Connect multiple bars together to create a customized display area. Comes with mounting hardware and push pins for quick posting. For best results use Quartet Accessories, sold separately. Board measures 48" x 1". SELF-HEALING CORK - Durable, self-healing cork helps extend the life of your board. Holes will re-close when push pins are removed, which helps prevent crumbling over time. COMPACT DESIGN - With its natural cork and sturdy aluminum frame, this board will add a classic look to your office or home. Both strong and stylish, it will be a great addition to your space. TACKABLE SURFACE - Quickly post items anywhere on the 1/4" thick cork surface. Convenient for hanging reminders or displaying reference documents. VERSATILE INSTALLATION - Flexible mounting lets you set up your cork bulletin bar either horizontally or vertically. Connect multiple bars together to create a customized display area. ACCESSORIES INCLUDED - Comes with mounting hardware and push pins for quick posting. For best results use Quartet Accessories, sold separately. Board measures 48" x 1".